May 21, 2013 0 comments on "DIY Wedding Decor: How to Make Kissing Balls"
Kissing balls originated in the Middle Ages as a symbol of good will. Traditionally they were made of evergreen branches and hung over the front door at Christmas time similar to mistletoe. Over time kissing balls became a symbol of romance and eventually became a popular wedding tradition. Also called pomanders, kissing balls are very easy to make. They can be made with either silk flowers, fresh flowers, or even from tissue paper. You will be using the bamboo skewer to create a hole in each side of the styrofoam ball. These holes will be used to insert the ribbon for hanging the finished kissing ball. Gently insert the bamboo skewer through the top of the ball, going in one side of the ball and out the other side. Remove the skewer and then use it to push a piece of ribbon through the holes you just made. Cut the ribbon, leaving enough ribbon to hang it when finished. Note: You can also use a knitting needle instead of the wooden skewer to create the holes. Next remove all the silk flowers off of the plastic stems, leaving only the flower part. 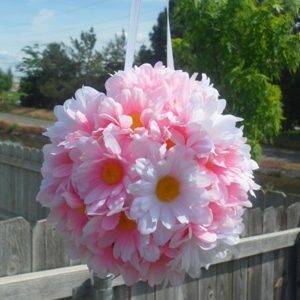 You will need at least 35 flowers to cover a 4 inch ball, more if you are making a larger ball. Take the first flower and press the end of it into the styrofoam ball, creating a small hole in the ball. Place a dot of hot glue in the hole and then put the base of the flower in place. Continue gluing on flowers until the ball is covered. To make a kissing ball from fresh flowers, you will need floral foam instead of styrofoam. Floral foam is specially made for fresh flowers. First completely dampen the foam ball. Next cut the stems of each flower, leaving 1 inch of stem on each flower. Gently press the stem of each flower into the floral foam ball, until the entire ball is covered. 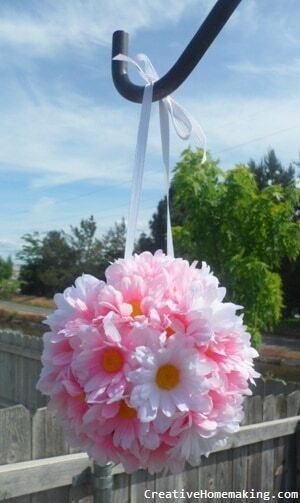 These balls must be made the day before they are going to be used or the flowers will wilt. Keep refrigerated if possible, and take care not to crush the flower petals, as these are very fragile. 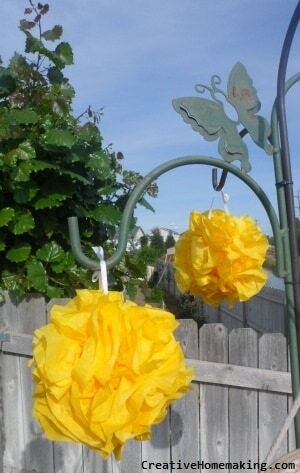 If you can’t spend the money on real or silk flowers, then try this less expensive version made with tissue paper. To make one tissue paper flower, you will need to cut four pieces of tissue paper into rectangles approximately 10 inches by 5 inches. Stack the four pieces of tissue paper on top of each other and fold them like an accordian, like you are making a fan. Fold over a half an inch then turn it over and fold another half inch on the other side. Continue turning it over and folding it until it is completely folded up. Cut a piece of floral wire a couple of inches long and twist it around the center of the stack of tissue paper you just folded. Use the scissors to round the ends of the tissue paper, cutting through all the layers of tissue paper. Next start pulling the strips of tissue paper away from each other, separating all of them on both sides. Keep pulling them apart and arranging them, spacing them until it starts to look round and takes the shape of a flower. Twist the two ends of the floral wire together and gently insert them into the styrofoam ball. Continue making flowers and inserting them into the ball until the ball is covered. You will need at least 15 of these flowers to cover a 5 inch ball. Kissing balls are easy to make and can be used for wedding decor in a variety of ways. Whether they are carried as beautiful bouquets, hung from the ceiling or from shepherd’s hooks along aisle ways, or displayed on tables on candle stick holders, they will make an attractive addition to any wedding.